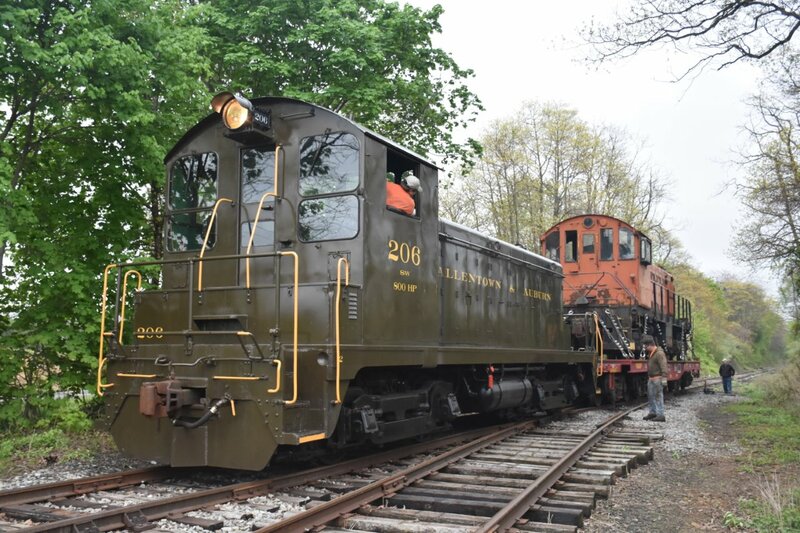 LORAM's rail grinding operation on Friday morning along the Lehigh Line started once NS's morning trains had passed by. 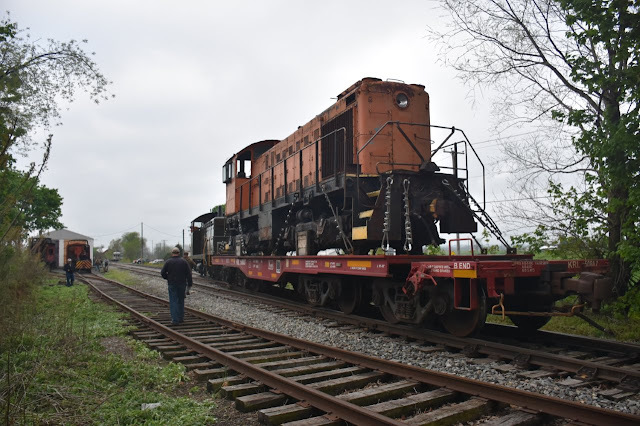 Seen here the rail grinder is coming off the Lansdown Jct siding, located near Clinton (NJ), after NS local H76 headed east. Also included are two roster images of some of its LMIX 3405 consist. That tank car might make for a interesting HO modeling project. I was told that this train then headed west. 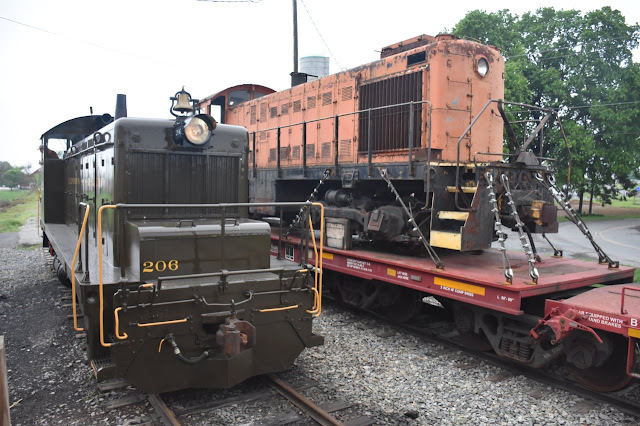 Decided to head to Pennsylvania on Saturday to try and photograph Steamtown's Scranton to Jessup excursion. 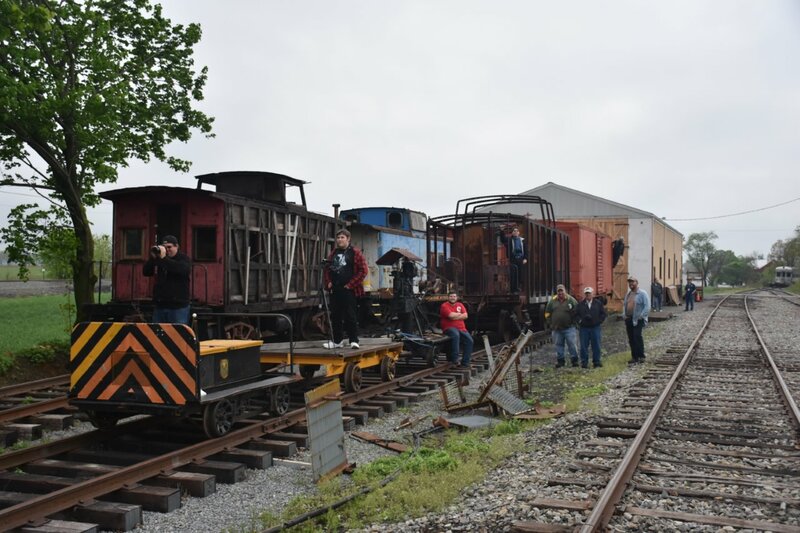 This excursion was billed as "Celebrate Memorial Day with a World War II troop train, the Jessup Fireman's picnic and a historical tour." I managed to catch the train approaching Olyphant's North Valley Avenue grade crossing around 1:30. 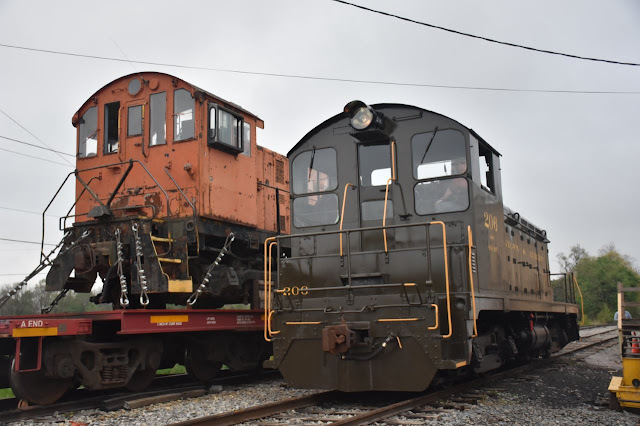 DL's 405, an ALCO C420, lead a three car consist of CNJ coaches. That first coach was empty but the remaining two coaches was packed. Had to feel a little compassion for those re-enactors dressed in the WW II military garb when I saw them seen walking around in Jessup on such a hot and humid day. Prior to leaving for PA though, I was stopped at Raritan's (NJ) Thompson Street grade crossing for NJT's 5512 and managed to snap this image of a safety slogan on the bi-level . The message on the side of NJT's 7056 certainly catches one's eye. Tour of Somerville Coming Tomorrow! 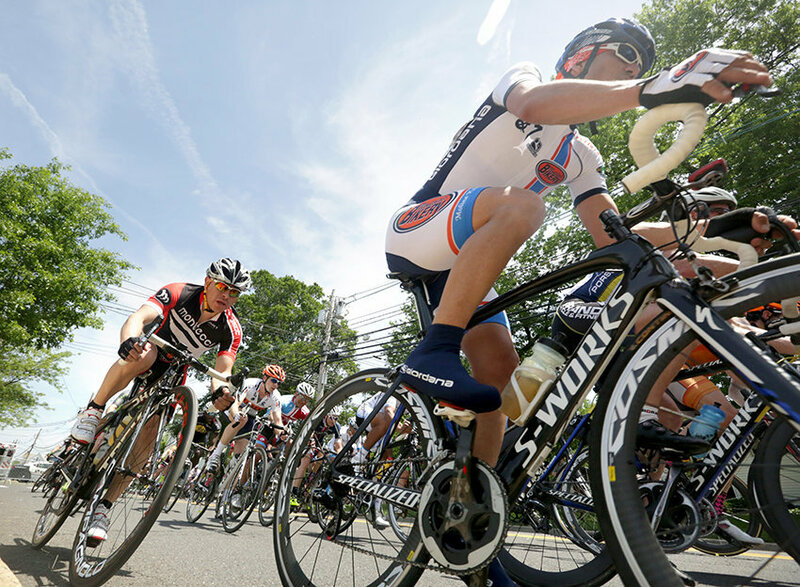 SOMERVILLE - The Tour of Somerville, the oldest major bicycle race in the nation, takes place Monday, attracting hundreds of racers and thousands of spectators. The day begins at 9 a.m. with a Memorial Day parade, with races starting at 10:45 a.m. The races, culminating in the 50-mile Kugler-Anderson Memorial, date to 1940. After being suspended for four years from 1943-46 because of World War II, it has been held each Memorial Day. A woman's race was added in 1976. The race was started by borough bike shop owner Fred "Pop" Kugler, whose son, Furman, a successful professional rider, wanted a race that was closer to home. Furman's prize for winning was a $75 bicycle, an oil painting, a badminton set and a trophy. Since then, prizes have included furniture, appliances, carpeting and even a brand new Chevrolet in 1953 have been given to winners, according to the Tour of Somerville website. For the first time in its history, this year's Tour will offer the same $10,000 purses for the top finishers in the men's and women's featured races. "For decades both amateur and professional cyclists from around the world have been able win cash prizes, but many of the best female cyclists have had to settle for less than their male counterparts," said Tour promoter Lisa Werner. "We are proud to announce that, here in Somerville, that changes this year." 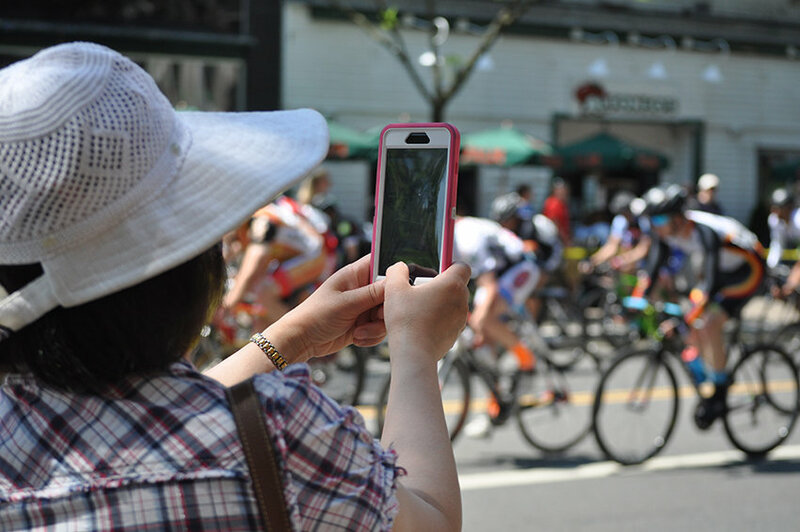 The Tour of Somerville has expanded in recent years to include the Bound Brook Criterium being held 1:30 p.m. on Sunday starting on West Cherry Avenue. The races include a 40-mile professional ride. A race in Raritan, held in past years, is not taking place in 2016. Also new this year is a sprint for boys and girls ages 3 through 12 in Somerville on Monday prior to the Tour of Somerville's women's race. In addition to the racing, there is food, activities for children, live music and entertainment, and the Memorial Day parade at 9 a.m.
Why do they race on Memorial Day? Furman Kulger won the race in 1940-41 and his one of his closest friends, Carl Anderson of Clifton, won in 1942 when Furman sat it out. During World War II, Furman was killed in Okinawa and Anderson lost his life in Belgium. Renewed in 1947, the Tour was renamed "The Kugler-Anderson Memorial" and has been held every Memorial Day since. A total of 15 New Jersey men have won the the Kugler-Anderson Memorial in 72 runnings. The longest gap between winners being from the Garden State was 23 years (1969-1992). No New Jersey women have won the Mildred Kugler Women's Open. The Cromwell Cup, the perpetual tour trophy, was donated in 1940 by the Canadian government and named in honor of James Cromwell, U.S. minister to Canada and Doris Duke's husband. Six Canadians, two people from New Zealand, and one each from Holland, Germany and Belgium have won the men's or women's races. The 1955 winner, Patrick Murphy, was a 21-year-old from Ontario, Canada, "who took time off from a honeymoon tour of the states to win the Tour and set a new record of 2 hours, 2 minutes," according to the Tour of Somerville website. The Tour of Somerville has been called the "Kentucky Derby of Cycling" and the race was profiled by Sports Illustrated. The borough was once home to the U.S. Bicycling Hall of Fame, now located in California, and many professional riders still use the race as a warm-up to upcoming events, including the Philadelphia International Cycling Classic taking place June 5. The Tour of Somerville benefits several local non-profits, including Jack's Kids and Middle Earth. It is promoted by Arts on Division, a Somerset County resource that promotes all aspects of culture and the arts, for the benefit of Jack's Kids, a Somerville Elks initiative that eases the financial burden to families dealing with a serious childhood illness and disabilities. 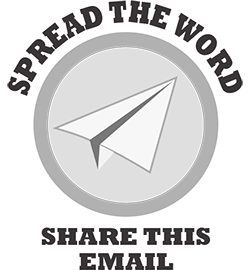 Jojo Mosca, a senior at Somerville High School, won a contest to design this year's tour T-shirt with a bright yellow design that uses the letter O in the event name to be the wheels of a bike. Proceeds from the sale of the shirt will benefit Middle Earth. Jonas Carney, a Hunterdon County native, won the race five times between 1992 and 2003. His brother, James M. "J'me" Carney, also won in 1994. Jonas Carney's career includes two Olympic appearances, in 1992 in Barcelona and in 2000 in Sydney, as well as numerous national track titles, criterium wins and the USPro Criterium Championship. Today, he directs the the Rally Cycling Team. James Carney also represented the United States in the 1992 and 2000 Summer Games, placing fifth in the 40 kilometer Points Race, the highest finish by an American in that event. He is also a two-time World Cup champion. Karen Strong, who won four times in 1977 and again from 1979 to 1981, competed in the women's road race at the 1984 Summer Olympics. She also has a number of international wins and silver and bronze medals in World Championship competition. The three, three-time winners, have all won national and international events. Sue Novara-Reber's final Tour of Somerville win in 1984 was followed up three days later by a win in the Central Park Race in New York City. Tina Pic is still competing at age 50. Her racing resume includes earning the most points in the USA Cycling National Racing Calendar in 2002 and 2004-06. Pic was also an alternate for the 2004 Summer Games in Athens. Thursday, June 9, 7:00 PM at the Bickford Theater of the Morris Museum; 6 Normandy Heights Road, Morristown, NJ 07960. Gene Collora is a lifelong railroad photographer and a 38-year veteran of the Long Island Rail Road. Specializing in large-format black and white photography, Collora’s images have been universally praised for their superb quality and composition. Collora has combined his skills in photography with his Long Island Rail Road career to bring us this unique presentation on the LIRR’s often-forgotten freight operations. Gene’s photos from the 1960s and 1970s will showcase the LIRR’s complex blend of passenger and freight operations. For example, passenger locomotives sometimes moved freight in between morning and evening rush hour! Collora’s work has been featured in multiple articles, books, and other railroad publications over the past several decades, and he has recently written two of his own photo books for The Garbely Publishing Company. These limited edition hardcover books will be available for sale at the presentation for $40 each. JACKSONVILLE, Fla. – May 23, 2016 – CSX (Nasdaq: CSX) today appointed new Operations leaders to accelerate the pace toward next-generation safety, service and efficiency. Mike Smith, vice president-network operations, will move into the new role of vice president-PTC and strategic implementation. In that role, Smith will oversee implementation of the safety technology Positive Train Control, and will also align other strategic initiatives related to CSX’s more than 21,000-route mile network. Bob Frulla, vice president-northern region, will replace Smith as vice president-network operations. Frulla has extensive field and headquarters experience, including division manager in several locations and general manager-network operations. Smith and Frulla will report to Cindy Sanborn, executive vice president and chief operating officer. In addition, Jermaine Swafford, who has successfully managed the southern region, will expand his network experience as vice president-northern region. Chicago Division Manager John Bradley will become vice president-southern region. Swafford and Bradley report to Mike Pendergrass, vice president and chief transportation officer. Robert Holtz, assistant division manager in Chicago, has been named division manager, replacing Bradley. All of the changes are effective June 1. JACKSONVILLE, Fla. – May 20, 2016 – Michael J. Ward, Chairman and Chief Executive Officer, today announced a number of senior management changes, including the retirement July 1 of Lisa Mancini, executive vice president and chief administrative officer, following nearly 13 years of exemplary service to CSX Corporation (Nasdaq: CSX). Mancini joined CSX in 2003 and is a member of the chairman’s executive management team, with responsibility for people functions, procurement and real estate. “We thank Lisa for her many contributions to CSX’s people and success. We wish her the very best in her retirement,” Ward said. The company is realigning the senior team to advance its vision for the workforce, service, productivity and technology of the future. Cressie Brown, currently vice president-labor relations, will become senior vice president and chief administrative officer, and Kathleen Brandt, currently head of the company’s information technology subsidiary, will become senior vice president and chief information officer. Both moves will be effective July 1, and both leaders will join the executive management team, reporting directly to Ward. Brandt joined CSX in 1985 and rose through the information technology organization, becoming its leader. She has succeeded in key roles in organizational strategy and capital planning, and has ideal skills to lead CSX teams in accelerating deployment of automation, analytics and systems to contribute to next-generation safety, service and efficiency. Brown, who joined CSX in 1988, held leadership roles in critical operational and support functions including technology, finance, service design, and customer service before her most recent appointment as vice president-labor relations.  With these roles, Brown has gained deep and broad organizational expertise. She understands the vital role of CSX’s people in shaping the company’s future and is committed to their continued development and success. Zachery M. Jones has been appointed vice president-labor relations to succeed Brown. Jones, who previously was with the National Mediation Board in Washington, D.C., joined CSX in 2010 and is currently assistant vice president-employee services. In that role he has been closely involved in positively addressing workforce issues and improving employee engagement. His knowledge and experience give him tremendous credibility and background for this new role. “These promotions underscore the importance of continuing to develop our highly skilled and committed employees, while accelerating CSX’s next-generation technologies and performance in safety, service and efficiency,” Ward said. JACKSONVILLE, Fla. – May 17, 2016 – CSX Corporation Executive Vice President and Chief Financial Officer Frank Lonegro spoke with investors and analysts today at the Bank of America Merrill Lynch Transportation Conference in Boston, updating them on second-quarter volume trends and the company’s plans to continue managing through the transition in its business mix. At the same time, continued service improvements are supporting strong pricing through this business cycle. With the impact of improving service and ongoing initiatives to drive further network efficiency, CSX now expects efficiency savings for the full year to exceed $250 million, approaching a company record. However, market forces are still expected to more than offset the gains in safety, service, pricing and efficiency, resulting in the company’s first full-year earnings decline since the recession. Looking forward, CSX is driving long-term strategies to maximize its evolving business portfolio, including transforming its network to match resources with demand, leveraging technology solutions for service and efficiency, investing in the future of intermodal, and continuing to focus on delivering excellent service for customers. 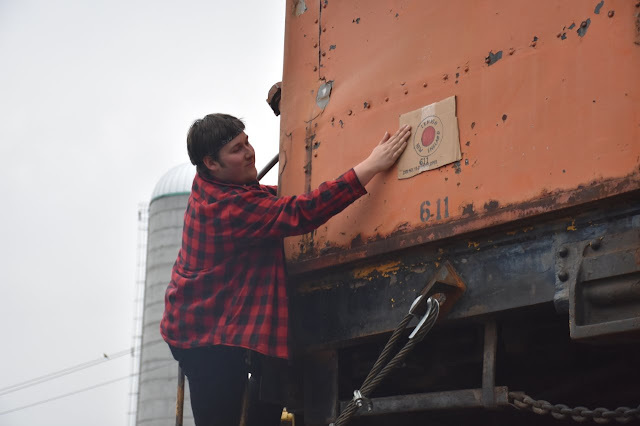 As the company’s business transitions to merchandise and intermodal markets, these initiatives are designed to drive earnings growth and margin expansion as CSX continues to target a mid-60s operating ratio longer term. NORFOLK, Va., May 18, 2016 – Norfolk Southern Corp. (NYSE: NSC) Executive Vice President and Chief Financial Officer Marta R. Stewart will make a presentation at the Wolfe Research 9th Annual Global Transportation Conference. Where: Marriott Eastside Hotel, New York, N.Y. This announcement, as well as additional financial information, is available on the company's website athttp://investors.csx.com. CSX also uses social media channels to communicate information about the company. Although social media channels are not intended to be the primary method of disclosure for material information, it is possible that certain information CSX posts on social media could be deemed to be material. JACKSONVILLE, Fla., May 13, 2016 -- On Wednesday, the Board of Directors of CSX Corporation (Nasdaq:CSX) approved an $0.18 per share quarterly dividend on the company's common stock. The dividend is payable on June 15, 2016, to shareholders of record at the close of business on May 31, 2016. The big achievements of 2015, Squires said, included improving customer service to near-record levels and embarking on a bold new five-year strategic plan to drive growth, streamline operations, improve network performance, and deliver enhanced shareholder value. The plan targets annual expense savings of more than $650 million and an operating ratio -- a key indicator of operating and financial performance -- below 65 percent by 2020. “The plan is designed to deliver sustainable, profitable growth by optimizing pricing and targeting service-sensitive markets,” Squires said. As indicators the plan is working, Squires cited Norfolk Southern’s first-quarter double-digit improvements in operating income, net income, and earnings per share, coupled with a first-quarter record operating ratio. “Our strong first-quarter 2016 performance gives an early glimpse of the opportunities that await us through solid execution of our new strategic plan to drive enhanced profitability and shareholder returns,” Squires said. Squires’ remarks are posted in the Investor Relations section of the Norfolk Southern website. · Re-elected 11 directors for terms expiring in 2017: Thomas D. Bell Jr., chairman of Mesa Capital Partners LLC; Erskine B. Bowles, senior advisor and non-executive vice chairman of BDT Capital Partners LLC; Robert A. Bradway, chairman and chief executive officer of Amgen Inc.; Wesley G. Bush, chairman, chief executive officer and president of Northrop Grumman Corporation; Daniel A. Carp, non-executive chairman of Delta Air Lines Inc.; Steven F. Leer, former chief executive officer and chairman of Arch Coal Inc.; Michael D. Lockhart, retired chairman, president, and chief executive officer of Armstrong World Industries Inc.; Amy E. Miles, chief executive officer of Regal Entertainment Group; Martin H. Nesbitt, co-founder of The Vistria Group; Squires; and John R. Thompson, former senior vice president and general manager of Best Buy.com LLC. Karen N. Horn, a partner with Brock Capital Group, retired from the board effective this meeting, and Charles W. Moorman, former CEO of Norfolk Southern, retired as a director Dec. 31, 2015. · Ratified appointment of KPMG LLP as auditors. · Approved an advisory resolution on the compensation of executive officers. JACKSONVILLE, Fla. – May 10, 2016 – Frank Lonegro, CSX Corporation (Nasdaq: CSX) executive vice president and chief financial officer, will address the Bank of America Merrill Lynch Transportation conference in Boston on Tuesday, May 17, at 8:40 a.m. Eastern time. Present: "Dia de las Madres"
We will celebrate "Dia de las Madres" with a delicacy native to Mexico - chocolate! A chocolate gift for your "Mamacita" and tastes of our romantic chocolate-Shiraz wine, Beseme (means "Kiss me" in Spanish). Our chocolate infused barrel aged Shiraz. Fortified to 18% alcohol, this sweet and delicious wine is truly "un beso de chocolate!" 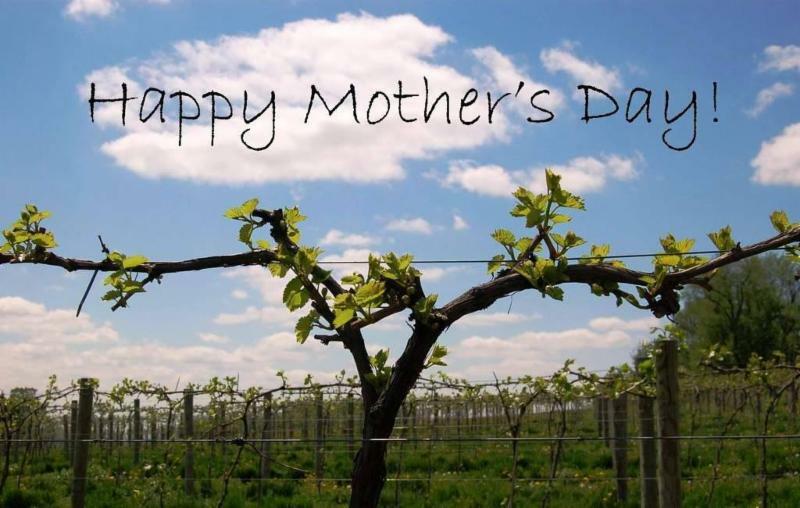 Book your tickets today for the Warren County Winery Train "Dia de las Madres" May 7th & 8th. On the 7th and 8th Mom's ride free on the River Train. 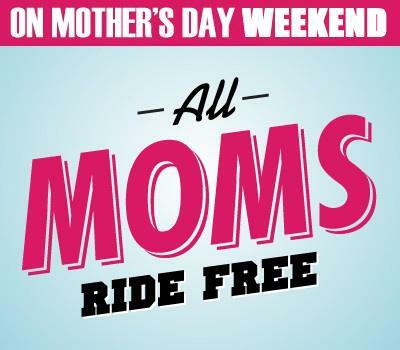 One free Mom with any regular fare ticket. Does not include the Winery Train. Garden State Division - N.M.R.A. a non-NMRA member to this event. What will I bring for Bring and Brag this time??? I been working on 1/12 scale model of the NYSME "HO" Layout for our rebuilding project.